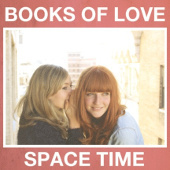 While hiking past the Griffith Observatory in Los Angeles, friends Katy Goodman and Greta Morgan were struck with the idea to record a song together: A song about physics and love, science and romance, space and time. Have you ever felt the lovesick pain of falling for someone from a different dimension? We have too. The next morning, the girls recorded “Space Time” in Greta’s tiny rehearsal space in Glassell Park. While “Space Time” may not be a hit in this dimension yet, the song is topping charts in many others. The girls have plans to tour the Andromeda Galaxy this summer, appear in Bode’s Galaxy this Fall, and make an appearance at the Omega-Palooza Festival to break up the 2.9 million light-year long trip home. Until then, they will continue enjoying life in this space-time, where Katy is writing the next La Sera album and Greta is about to embark on a tour with The Hush Sound.